The Institution of Occupational Safety and Health (IOSH) is making Managing Safely and Working Safely available in a non-English language after feedback from its network of training providers in the region. 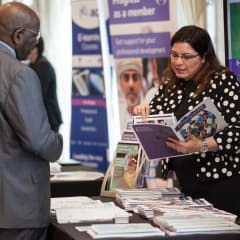 Announcing the move at IOSH’s Middle East Conference, in Doha, on 27 April, IOSH Training and Skills executive director Richard Orton said the Arabic-language versions could be applied to any industry sector and were now available to order. It comes after an IOSH survey of 250 business leaders in Gulf Corporation Council found that nine out of 10 agreed investment in health and safety was essential to ensuring their business had a good reputation, was resilient and was productive. Eighty-five per cent of the decision-makers agreed that their employees' health and safety was a top priority at board level, with 88 per cent agreeing that all employees had a responsibility for health and safety. Orton said: “We have a network of training providers across the Middle East who tell us there is a demand for Managing Safely and Working Safely in both English and Arabic, so we knew it was time to support those businesses employing Arabic speakers. The Middle East market has the most licensed providers for IOSH training courses outside of the UK. The translation comes after IOSH produced revised versions of Managing Safely and Working Safely, along with its Leading Safely course, last year. The amended versions are far more adaptable to non-UK audiences than before, making it easier for the Arabic-language courses to be translated without needing changes in content. IOSH first brought Managing Safely and Working Safely to market over 20 years ago. During this time they have developed a strong reputation, not only in the UK but also in the Middle East. Last year 180,000 delegates participated in 15,000 IOSH-accredited training courses in 74 countries.